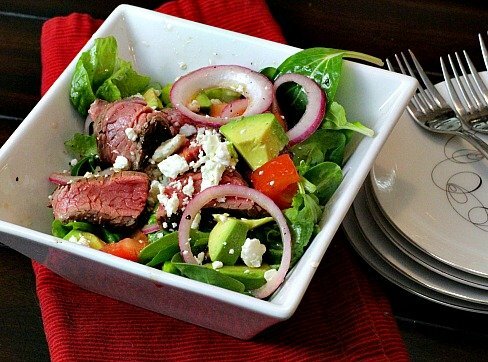 Chipotle Glazed Steak Salad. A nice crunchy sear on the steak from a chipotle glaze and a zesty flavor from pickled onions. Add creamy avocado, mixed greens and you’ve got a wonderful steak salad. An entree salad recipe that you’ll want to add to your database. What Makes A Great Steak Salad? I love a good steak salad. It must be something about the contrast in texture and variations in the temperature of the ingredients. The best steak salads give you meat that is juicy and flavorful with a charred exterior crust on the steak complimenting fresh, crisp lettuce. The glaze is the key to this salad because the sugars in it caramelize and create that crunchy exterior. Friends don’t let friends eat Mexican food without pickled onions. 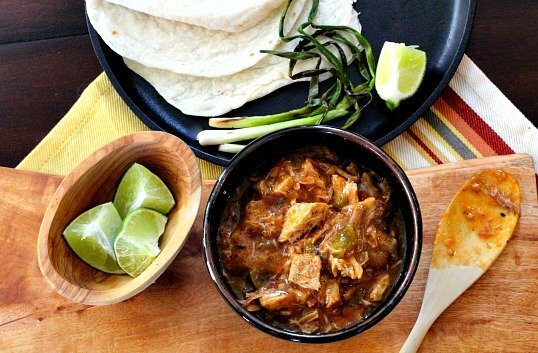 If you’ve never pickled an onion, or had them at Mexican restaurant, you’re in for a treat. All you need is some vinegar and a red onion. The first time I had them was at an upscale Mexican restaurant in Denver. So exciting with flavor, that as soon as I got home I scoured the internet for a recipe that seemed to mirror what I had just had. I was very pleased with my choice and made my first pickled onions. That recipe has more ingredients along with a cooking time. This recipe for quick pickled onions is a great find and wonderful for this salad. A thirty minute bath in red wine vinegar and voila! You’ve got a a ring of zesty bliss. Pickled onions make just about anything better; Tacos, tostadas, grilled cheese sandwiches, salads, and grilled meats. Before we get to the recipe, let’s talk about this photography challenge. This week’s Dogwood Photography challenge was to photograph a traditional landscape. “Shoot a beautiful landscape and share it with the world. Find a nice foreground and don’t forget the sky,” they said. “It will be fun,” they said. Snore. One of my favorite vistas in Highlands Ranch. My walking trail with a breathtaking view of Mt. Evans. All bundled up, camera in hand, for two evenings I got nothing. No clouds to reflect color. not even a coyote to add some excitement. This is the same location of the photo I have on my About page. Becoming discouraged, the famous Highlands Ranch windmill sits directly behind and to the East where I’m standing. Ah-ha that’s where color and clouds are hiding. Not bad, but I wasn’t pleased with the “find a nice foreground” part of my assignment. Plus that “interesting” cloud is just a contrail. The next two mornings I spent bundled up at the top of the hill just a couple of block the other direction from our house. 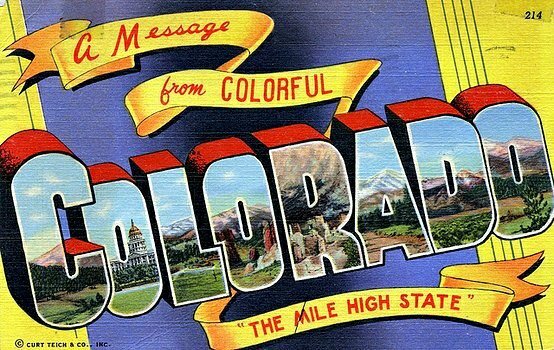 Feeling very clever with the Colorado Flag as my foreground, I might as well have stayed in bed with my coffee. Again, nothing interesting to make this photo pop. Flat…blah…yawn. Back at it the next morning and about 15 minutes earlier, and finally some clouds to illuminate Mt. Evans. I made sure the flag was closer to the edge of the photo as to not distract, and clicked away. Being down to the wire, this is the photo I chose. Even though this is looking West, we do have some spectacular sunrise effects over the mountains. When the sun comes up, those mountains just glow with some even more spectacular cloud formations than you’re seeing in this photo. What I learned: A beautiful panorama does not automatically make a spectacular photo. One needs to find the beauty in closer and more everyday natural settings. If you look, it’s everywhere. A South of the Border entree steak salad recipe. Put the onion in a small bowl and pour in enough red-wine vinegar to cover well. Set aside for at least 30 minutes. Combine the lettuce, tomatoes, and avocado in a serving bowl or platter. In a small bowl, whisk together 2 tablespoons of the red-wine vinegar from the marinating onion, 2 tablespoons of olive oil, and salt and pepper to taste. Set aside until you are ready to dress the salad. Combine the ketchup, honey, chipotles, adobo sauce, and 1 teaspoon salt in a blender and purée. Set aside. Preheat a grill to medium-high for 10 minutes or preheat a grill pan over medium-high heat. 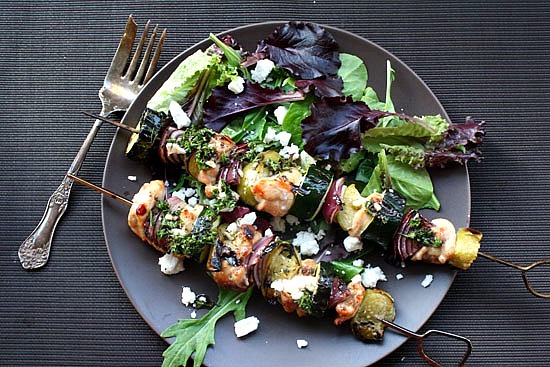 Brush the grill grates or grill pan with the remaining tablespoon of oil. Season the beef on both sides with salt and pepper. Grill the meat for 4 minutes, turn over, and brush the glaze over the steak. Grill for another 4 minutes, turn over, and glaze the other side. Allow the meat to cook for another 2 minutes on each side to caramelize the glaze. Pour the dressing over the lettuce mixture and toss well. Place the sliced beef over the salad and top with cheese crumbles and marinated red onions. Chipotle Glazed Steak Salad …It’s what’s for Dinner. HI Lea Ann, I’m enjoying the photography almost as much as that delicious-sounding recipe. I like the one you chose, but I also like the windmill photo. I like the red-gold morning light that is turning the grasses into little torches. I looked on the Dogwood site – I like the challenges so perhaps I’ll try some. Hope you aren’t freezing down on the Front Range. It’s been so cold in Breckenridge and today windy, too. Bev and I both enjoy an good steak salad like this and your meat looks perfectly cooked. I think your last shot was well worth the return trip the next day. Steak salad is like a steak sandwich without the carbs. Your picture made my mouth water! And your landscape shots are wonderful. I’ve decided to take the challenge (it’s on my list for this three day weekend) but I’m really having a fit with the landscape. The days are gray and the snow is relentless. Keeping my camera out and ready for a spot of sun! Hi Lea Ann, what a great challenge, good for you! My husband and I would both love this salad, will have to pickle some onions, sometimes it’s the little things you do that make something over the top special. Wonderful photos, please keep them coming. I need this salad now! Seriously… I love your pictures. We sure do live in a pretty place! Great photos, Lea Ann. Colorado is so beautiful in the winter. 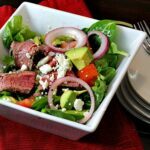 Steak salad is one of my favorite meals and you have added some special touches to yours. The pickled onions look delicious and I’m going to try them today. They add so much flavor to many dishes. I usually use a simple vinaigrette but your chipole dressing sounds much better. You’ve got to try those pickled onions. Salad looks delicious. Love the wind mill picture. Actually, I love all the pics. My goodness, you are taking this challenge seriously! We love a good steak salad and I happen to have some grilled steak left from our dinner last night. I need to try those pickled onions because usually I pick the onions off of my salad. All beautiful photos, especially the last one. What a great challenge and indeed a challenge! Landscape photography is hard. We always think about color, we forget how powerful black and white can be in landscapes. You might try converting some of your pictures to b&w, and playing with the tones a bit — you may be surprised at what you have. Anyway, terrific dish — thanks. Loving this seared chipotle steak with marinated onions. We both must be on the same wavelength this week and craving some extra protein and iron. I could not agree more sometimes it is not the setting but the artful eye. I love your photos and I think they are gorgeous.